Our baked goods are handmade – because nothing beats dough that you freshly make and roll out yourself. We use only free range eggs, Australian butter and fresh milk. You can raid our pantries and won’t find any shortening. 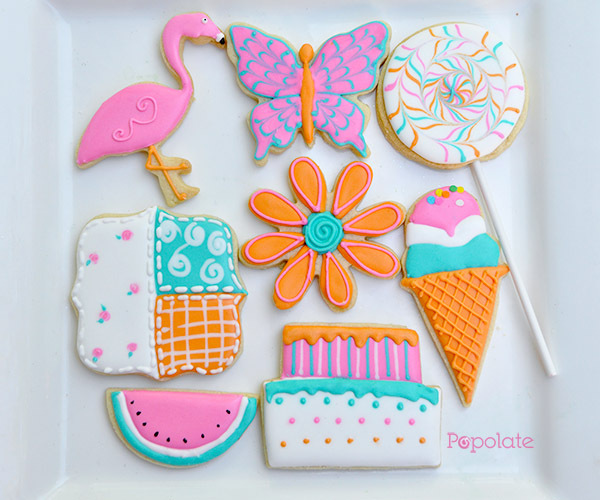 Popolate specialises in custom made treats. Food is at the heart of every party, and we believe beautiful food made just for your event creates a unique buzz. Our tagline, “Feed the Fun” says it all about our philosophy. Su, the founder of Popolate, came to baking and decorating late. For 10 years of her working l ife as a journalist, she crafted with words, not icing. Her area of coverage was not fashion or food, but business and finance. After moving to Sydney in 2011, she stumbled upon photos of cake pops, and was enamoured by how cake could be shaped to make almost anything. Her love of food meant that the treats not only had to look good, they had to taste good as well. Since then, Popolate has served up thousands of treats, at events big and small, featuring at university open days, fashion nights, awards and corporate events. As Steve Jobs once said, ““You can’t connect the dots looking forward; you can only connect them looking backwards.” It turns out, the key to making a successful cake pop or cookie is similar to being a good journalist – attention to detail is key. Her experience in setting layout and covers for print publications taught her to judge what is pleasing to the eye. The second key to making a good cake pop, or good anything, is patience and perseverance. Su has demonstrated at craft fairs and cake guilds, contributed to Cake! magazine and regularly run classes on cake pops and cookie decorating. We take a no frills approach. You get quality cake pops and cookies but you don’t pay for what you don’t need. You can add on extras, like tags and packaging, but it’s entirely optional. The cost is the same whether you are ordering for your child’s birthday party, a wedding or a commercial event. We place my priorities on the quality of the food. We tell it like it is. Honesty is the best policy, and if the pop won’t travel well, or certain elements of a proposed design won’t taste good, we’ll say so. We appreciate both fun and nutrition. These goods are made exactly the same way Su makes them for her own kids (and they are often the taste testers or happy consumers of rejects) – each batch is freshly baked with free range eggs, permeate-free milk and Australian butter.